Stand out from the crowd. Don’t be a sheep! In my previous blog, I looked at the importance of having a strategy firmly focused on the needs of our customers. In this blog I’ll be looking at how that translates into creating actions and daily work-plans. Review your Strategic Plan. It's a vital document. So, with a clear sense of what we can offer that is irresistible to our customers – we also need to make sure that it stands apart from the offerings of our competitors. A product which is really different (ideally patented). A superior service with a unique system to deliver it. Better operational efficiency and effectiveness. The most highly rated brand. Any USP that can easily be copied doesn’t stay a USP for long – and then all you can do is compete on price and reduce your profits. Any business, large or small, that wants to differentiate itself has to be set-up to deliver that USP better than anybody else! It also needs to consider developments in the wider environment that it operates in. Again, I’m sure the readers of this blog are familiar with SWOT analysis: the Strengths and Weakness of the business (internal factors) against and Threats or Opportunities from wider environment (external factors). Then the overall marketing led strategy needs to be converted into operational plans. The overall objectives of the business need to be broken down into financial objectives and all the operational objectives that will deliver the strategy: sales and marketing, product/service delivery, finance, legal, admin, HR etc. From there, objectives and targets are broken down into projects to achieve them, with defined stages and milestones (agreed points at which those stages are complete) – and then into smaller tasks and actions. I’m aware that this blog isn’t a comprehensive guide to Strategic Planning. There are countless weighty books on the subject. My intention here is to serve as a reminder to the countless SMEs that are too busy working their businesses that it’s essential to review and renew their Strategic Plan. So to recap again. Having a carefully thought out Strategic Plan is vital. It’s the primary task from which all other activity should flow. Selectivity is a key leadership skill – and that can’t be done without clarity on what we’re trying to achieve, why and how. Strategic Planning is the thinking that needs to be done to save us from running around like busy fools. If you haven’t looked at your plan for a while, or updated it for over a year, now is the time to sit down and do that essential thinking with your top team. Task 1: Having a Clear Strategy! A clear startegy is knowing what you want; what you're aiming at. It's about knowing your most important goals for the days, weeks, months and years ahead... and having a plan to achieve them. So what is strategy and is it important to have one? If you want to win the football World Cup, you wouldn’t vaguely form a team only to find that half your players prefer rugby and the other half prefer gardening. You set out with a specific aim in mind and every activity should serve that end goal. If you want to sail to Australia, you need to be clear about your goal and plan everything accordingly. And so it is in business. Having a clear understanding of what you want to achieve, why and how is the starting point of all other action. This is the key point. Most people I meet in business are incredibly busy... but is all that activity leading anywhere meaningful? A good strategic plan should be a living, breathing document that inspires worthwhile and well directed activity. It should form the blueprint from which all activity flows. It should inspire effective action for today, tomorrow and the future... and be the compass that tells us we're heading where we intended to go. So how do you formulate a strategic plan? 1. What matters to you most in business and life – and to know the problems you love to solve. What matters to you most in business and life? Who are you and what do you love to do? After all, if we’re paid for providing solutions to problems, we want to be clear what we love to do and why. 2. What problems your potential customers really value having solved - and are willing to pay you to solve for them. What problems are people willing to pay you to solve? Why do they want those problems solved? What does it give them? Why might they choose you above anybody else? 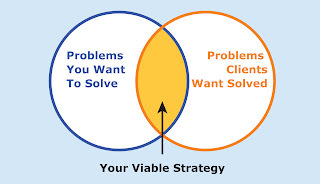 Having decided what problems we want to solve and what problems potential customers really value having solved - our solution needs to be firmly directed to the needs of the customer. “…it [the entrepreneurial business model] does not start with a picture of a business to be created but of the customer from whom the business is to be created. "What is value to the customer?" - It may be the most important question. Yet it is the one least often asked. It may sound obvious to any hardened business leader, but this stage is so often skipped and crude assumptions made... or businesses carry on doing what they've done for years without re-evaluating this starting point. But the objective is to set out on a journey that is really worth making, over and beyond making a profit. And to make sure that journey has a high chance of success. I’ve met too many people (and businesses) that have toiled for miserable years, ending up nowhere they really wanted to go. ...whether you're a sole-trader or the CEO of a multi-billion dollar corporation! In my previous blog I talked about the importance of leadership development. "To be a better leader, what do I need to do?" As with all areas of leadership, there are many hotly contested answers. Theorists often look at examples of great leadership, but only great leadership, for their research. Whilst this can be of value, it can also give us restricted and distracting answer. When you look at leadership in al its forms, from the momentary to the great, all examples contain a common theme; a common theme that can be broken down into a number of tasks. I describe these as The 7 Essential Tasks of Leadership. Have a goal and plan. Know what you want to achieve, why you want to achieve it and a sense of how you're going to approach it. Work the Plan. Working a plan is often about doing repeated tasks consistently. This requires developing good habits. What we do consistently becomes our culture. So in corporate speak, this stage is all about developing and managing a winning culture. Scan for meaningful change. Here we need to measuring and monitoring our progress. We also need to looking for significant changes in our world that could aid or upset our plans. Solve problems. From our scanning activities we may find an opportunity to embrace or a challenge to solve. Either way, we now enter the phase of problem solving or solution finding. Implementing solutions. Having come up with our best ideas, we now need to try them out by prototyping, testing, improving or starting again until we have a revised approach that works. We may also need to make our new approach stick in the long-term, ie embark on some form of culture change. Nurture relationships. Throughout the process, we'll need to identify and develop relationships that aid us towards our goals. We'll also need to reduce and diminish those that are distracting or negative. Communicate and Influence. Perhaps hardest of all is the task of influencing others appropriately and effectively; appropriately so that they are motivated and on our side, not negative or against us, effectively so that there is clarity between us. The more conscious we are of these tasks - and the more skill we have in executing them with precision - the better our leadership attempts will be. "What do I need to do to be a better leader?" What is Leadership Development - and Who Cares? Before I have time to answer, that question is followed by, “…quite frankly, what’s the fuss about? – I’m running my business successfully. I’ve a good team and we all know what we need to do... There's so many trainers, organisations and coaches out there promoting leadership development; people banging on about leadership. But frankly, we’re doing fine... If we were in a total mess I guess it could help, but then we wouldn’t have the money for it. So it’s not relevant to us. What’s the fuss all about?" So is Leadership Development important? Well, of course, I’m going to say yes. Getting the very best out of yourself and your team. Out of 10, how well do you and your people do what you do? What difference would it make to your performance/profits/job satisfaction, if you improved? And if you did improve by 5, 10 or 15% - how would you compare to the competition? and for you to reflect on and improve the most important things that you do. It’s also time to discover the things you don’t know you don’t know... whatever they may be. After all, it’s the invisibles (the things of which we are least aware) that can cause us most harm. So is leadership development important? – I’ll leave that decision to you. Leadership & Motivation - "Catch Yourself Winning"! One of the most important things to understand about leadership and motivation is… Emotions Drive Behaviour! The simple truth is - they do! And if emotions are at the heart of behaviour then they are also at the heart of leadership and motivation. But what is an emotion? So what does this have to do with winning? When we feel like we’re winning, our bodies fill with chemicals, especially testosterone, which make us want to keep going and try harder. Testosterone feels good… and whatever we were doing, we want to feel good and do it again. We want to create goals where we feel we can - and will - win. If a task is too great - break it down into manageable stages. If it looks unattainable - reconsider the plan! If things aren’t going well, one of the most important tasks is to be upfront about the situation – and then create a realistic and workable plan where even the smallest success can be celebrated. The more subtle art of motivation is knowing what other people want. What do they really consider to be ‘a win’ in the long-term? …How to find that out is another subject. Photo by April Davidson via Flickr. Blurry Eyed or Focused on the Vision? How Bumper Sticker Strategies focus teams on their vision. In Smart Things to Know about Strategy, by Richard Koch, he introduces the idea of a "bumper sticker strategy." This idea can be successfully used to produce a crisp, clear statement that sets the direction of a company - internally and to the outside world. Declaring what they do that's different from their competitors. Promising something of great value to all their key customers. Being underpinned by what they do better than anyone else (their core competence). Also being underpinned by a unique system to deliver it. The end result may be a little leaner than a mission statement. But in my opinion, if well crafted and memorable, they're much more use. This crisp, clear statement creates a focus for decisions and actions - at every level of a company. If a decision or action doesn’t in some way serve the strategy, it should be left out. Now... what is your Bumper Sticker Strategy? Photo by Paul Wicks via Flickr. This rule, derived from an experiment by Mehrabian, is frequently cited by communications trainers. Thankfully it’s being corrected in some training circles (see Training Professionals - thank you Alec McPhedran). If we think about this idea critically, we gain little 'factual or theoretical information' from body language and tone - it's the emotional content of the communication that gets conveyed this way. Imagine if this rule were true; books and legal documents would be have 97% of their meaning missing, cookery instructions would be given in sign language, maps and diagrams (the language of graphic symbols) would be completely useless – and so would Sat Nav. So why has this wrong idea become so popular? Can we trust the information they are giving us? Are they safe or a threat? Are they helping us or betraying us? Should we be glad... or very afraid? A core need as a human being is to establish trust in our dealings with other people. Without trust, all relationships, teamwork and long-term plans fall apart. Photo by Eric Munn Photography via Flickr. Hey! Let the mechanic drive ...see if he can do better! Play people in position. Use their natural strengths and abilities. Let them do the work they love to do, in the way they do it best, if it adds value to the company. make sure they’re up for the challenge, have adequate training and support, and time to acclimatise. Misusing this principle is a mistake often seen in business. Take an executive; let’s call him John, highly skilled in analytical, technical tasks, of high value to the company. He tends to work alone, make strategic decisions and recommend them to the Board. His contribution gets recognised. At a critical moment for the business, to raise performance, he’s promoted and becomes manager to a team of twenty people. – Guess what, he’s now playing out of position. His key skill was technical analysis. He prefers to work alone – and now his key requirement is managing people… Potentially, he may not even leave the Pit Lane. A key principle of team management is to play to people’s strengths, their natural skills and position. But if you want to stretch them into a less natural role – give them time to adjust and give them support. Executives can be promoted successfully to positions where new (and initially unnatural) managerial skills are required. If they aren’t natural leaders, they may need coaching and training – and time to acclimatise – before performing at their highest level. How to create a Superteam! Knocked out... but still a Superteam? Many teams in the World Cup had 'average' players, but still performed well. Some teams, like Brazil performed well and were sprinkled with superstars. Supposedly, England had it's fair share of superstars, but never got going as a team. So what went so wrong at the World Cup? Was a vital element missing from their teambuilding? 7 key factors to build a Superteam! My greatest suspicion falls on no2: ability in defined skills and roles. The players skills and roles were certainly defined. Players knew their positions and what is expected of those roles. And as some of the best players in the Premier League, they undoubtedly have enormous footballing skill. My understanding is that many of them were playing out of their usual position. I’ve said before, I’m not a football pundit, so please correct me if I’m wrong. But it seems to me that a trait of many England managers over the years is to pick players who excel in a certain position. They play consistently, week in week out for their Premiere League clubs – and then the England manager plays them in a new and strategic role – out of position – at the World cup. I’ve never understood it and I still don’t. Enlighten me someone, please, if there is any wisdom in their (in my opinion) madness! So a key principle for great teambuilding is to play to people's strengths. Play them in position. Use their natural strengths and abilities. Let them do the work they love to do, in the way they do it best, if it adds value to the company. If you need more from them, make sure they’re up for the challenge, have adequate training and support, and time to acclimatise - before you play them in a new position.